Version 4.2 introduced the ability to optionally create two new versions of pack layouts - Customer versions and Preview versions. Customer and Preview versions are never printed. They are for viewing purposes only. Only the printing version is ever printed. Prior to version 4.2, a tempate was all of these things - the same template was used to print, to preview products online and to display pages ready to print in the print queue. Customer versions of templates are used in the Timestone Internet Ordering System (IOS) when live rendering is chosen as the option to display products. (Live rendering means the customer sees their subject image inside the products as opposed to a generic static preview for all subjects). Consider a simple potrait package comprising of an 8"x10" portrait, 2 5"x7" portraits and 4 smaller wallet sizes at 3.5"x 2.5". In order to maximise the efficiency in printing this combination the layout is often designed for 10" paper giving a template that is 18.5" long by 10" high. 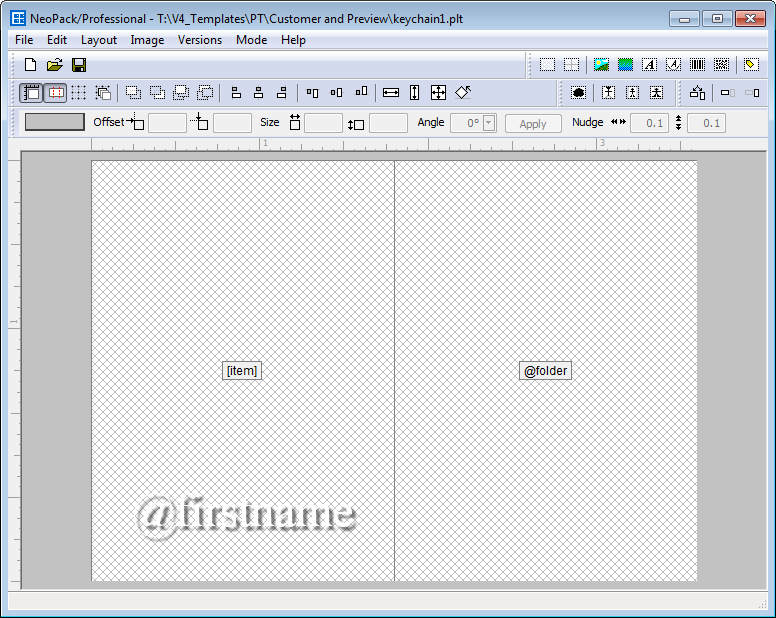 Arranging the image holes in the most efficient manner results in a template as shown below. 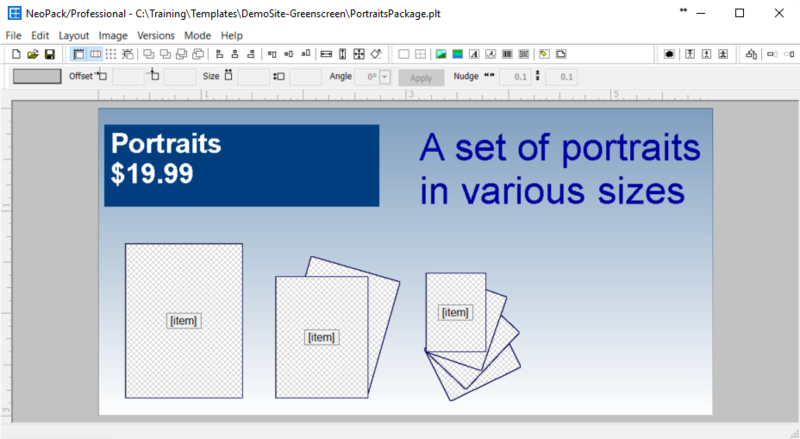 With the introduction of Customer Versions of templates it is possible to create a version of a pack layout template that is displayed to customers when viewing and ordering online. The customer version can be designed in any manner, making creative use of graphics, text and images to enhance the appeal of the product. 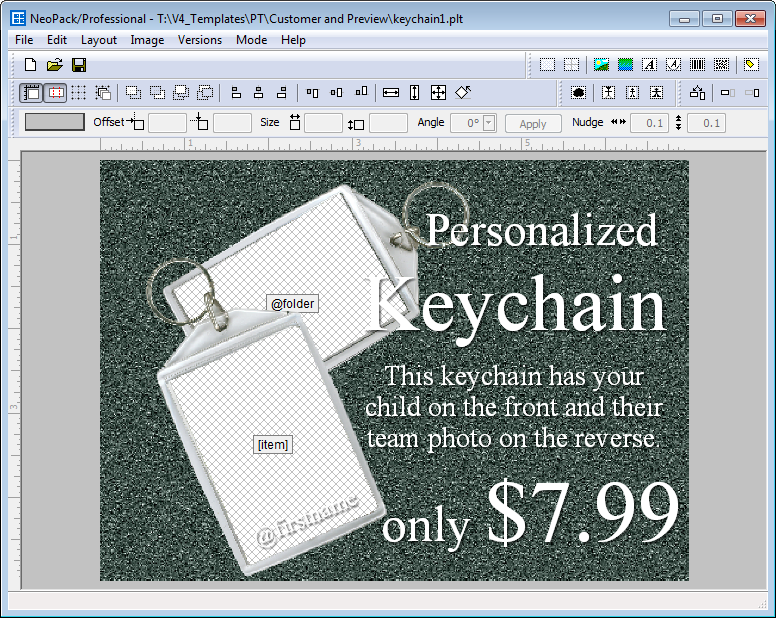 Online, the customer will see this version of the product complete with live rendering - the subject image is displayed rather than a generic image for all subjects. Consider a keychain where the front of the keychain includes the subject's portrait while a team photo is used on the back of the keychain. The printable version of the template could be as illustrated below. 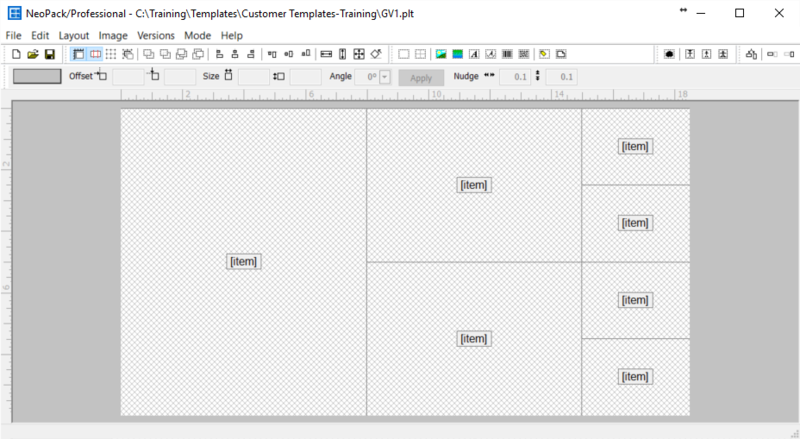 The customer version of the template can be far more decorative and informative. Using the customer version means the online customer has a far bettecustomertemplatesr appreciation of the product they are ordering.